You must play the game within the web browser in one of the two links provided above. This is to prevent cheats and anyone changing source code to gain an unfair advantage. You must have an account in lexaloffle.com in order to post your score in this thread. You can make an account for free to my knowledge, so this shouldn't be a problem. This is to make checking and tallying scores easier as it's all in one place. When posting your score, you must both write your score in your post and also post a screenshot of your score. You can submit your score as much as you want, in case you manage to beat your previous high score. Only highscores achieved within the week count, you cannot submit highscores from the past. With that out of the way, let the battle for glory begin! Magazine Update and Highscore Competition! The PICO-8 fanzine is still underway, don't fret, it's just that @e6host, who's doing the layout has been busy. Between today and tomorrow I'll give more specifics as to what percentage the magazine is done. Another thing I want to announce is a highscore competition for the PICO-8! 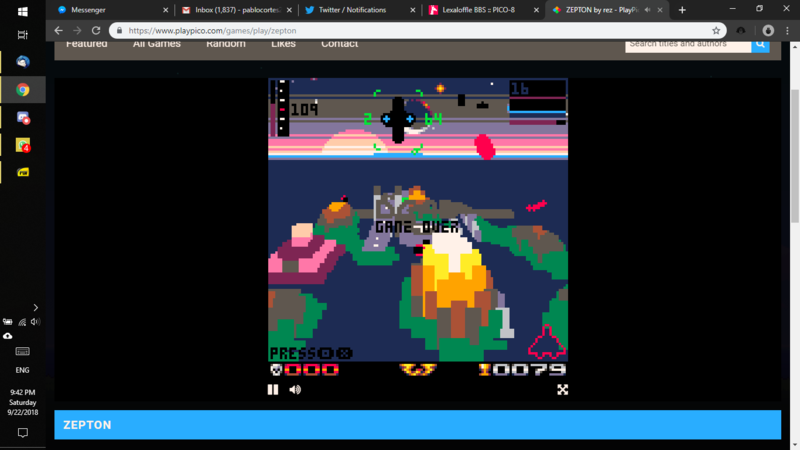 The PICO-8 community has a very strong maker culture, which is great, as that was @zep's original intention, however, no (fantasy) console is complete without a strong player-base, and I think that a highscore competition is a great way to foster that. It'll be a weekly thing, every week (or every week I possibly can) and the game will be chosen by me from playpico.com 's selection of curated games, though there maybe the occasional non-listed game if I feel it's good enough to my standards. The winners of these competitions receives honor and glory, and a shoutout. Once we're done with this current issue, however, there is a possibility that we might put on the next upcoming issues the winners of each weekly competition (hence, honor and glory, and the shoutout). With that said, the game will be announced tomorrow, Saturday. Just giving everyone a heads up. The competition will be run in Twitter, Facebook's PICO-8 group, Discord's PICO-8 server, and here. Therefore, the person with highest score, regardless of where he posted his score, will be the overall winner of the competition, and will have a shoutout across all platforms. Well I talked to Arnaud, and he gave me the green light to continue the fanzine since he's busy with his own projects right now. The topic for the fifth fanzine which was last voted for was micro-rpg, with sim being the runner up. If anyone is interested in writing articles, or if you previously sent articles or stuff to Arnaud, please send them to me. My email is pablocortes28 at gmail dot com. People interested in writing articles should read the thread link I posted at the beginning. Any questions or doubts, please comment here.